Key Difference: The main difference between a servant and a maid is the fact that maids are types of servants. They are also usually female, whereas a servant can be male or female. While today a house run by myriad of servants might seem farfetched, it was a norm just a few decades ago. While, an upper middle class household might have only a handful of servants, a larger richer household might have dozens. It was also not unheard of for large estate houses to have even 50 or 60 servants. A servant is essentially a person who is employed for some work. They can be male or female and may work in or around the house. Their responsibilities could include cooking, cleaning, providing care for children and elderly dependents, housekeeping, laundry, ironing, shopping for the house, taking care of the pets, driving, etc. Hence, the category of servant may include the Butler, Housekeeper, Cook, Footman, Valet, Governess, Nurse, Gardener, Coachman, Groom, Chauffeur, and Maids, such as housemaid, lady's maid, and/or, kitchen maid. Any and all of these working in a household will be grouped together under one heading of Servants. Maids are a specific type of servants. They are usually female, as evidenced by the term “maid” is shortened from “maiden” which traditionally meant an unmarried virgin girl. The maids usually worked in house, and are mainly responsibility for household chores such as cooking, ironing, washing, dusting, tidying up, changing bed linen, cleaning the house, grocery shopping, walking the family dog, and taking care of children, etc. This would depend on the size of the household, and the number of other servants hired. Primarily their jobs were and even still are similar to what private maids and hotels maids do today. A servant is a person who works for another person in any capacity. 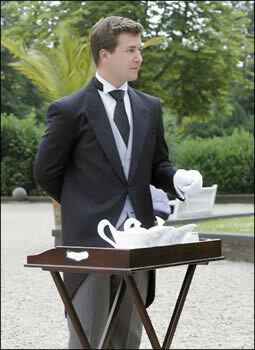 A maid, or housemaid or maidservant, is a female person employed in domestic service. Providing care for children and elderly dependents, housekeeping, cleaning, household maintenance, cooking, laundry, ironing, shopping for food, undertaking household errands, maintaining the garden, driving the family far, walking the dog, polishing silverware, making household repairs, cleaning the grounds, etc. Typical domestic chores such as cooking, ironing, washing, cleaning the house, grocery shopping, walking the family dog, and taking care of children. Butler, Housekeeper, Cook, Footman, Maids, Valet, Governess, Nanny, Gardener, Coachman, Groom, Chauffeur, Dog walker, Handyman, Groundskeeper, Masseuse, Personal shopper, Personal trainer, Security guard, Pool person, etc. Lady's maid, house-maid, Parlour maid, Chamber maid, Laundry maid, Nursery maid, Kitchen maid, Scullery maid, etc.